GOP convention organizers will try to reintroduce Mitt Romney to American voters this week. 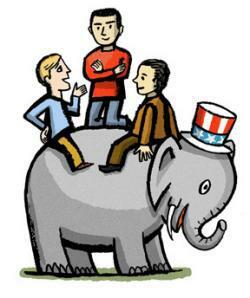 How will GOP convention planners try to package Mitt Romney? Having spent so much time in the hall, I’ve come to the conclusion (at least until my next entry) that the convention stage is destiny. I shall describe the stage for the readers at home. There are a dozen or so high-definition screens wrapped in warm-looking wooden frames. They float in the air offset from each other like a mobile you might buy in the gift shop at Fallingwater. Everything on the stage has had the same applied black-walnut wood surface poured over it—the lectern, the stairs, and the desk, which looks like it needs a receptionist to welcome you for your weekend at the mountain lodge. Bob Schieffer said the whole business looks like a Swedish spa. I think it looks like the basement movie room of a dot-com mogul who has just had a very successful IPO. You can watch the 49ers game and play Diablo 3 at the same time. Convention planners have tried to do with the stage what they’re trying to do with Mitt Romney: warm up a cool medium. The monitors are high tech and passionless. They’re so sharp they hurt your eyes. Wrapped in the wood, though, they take on a more comfortable feel. Or at least that’s the gambit. To some this will seem a stylish mix of new technology wrapped in a warm traditional look. To others it might be discordant, like those hideous amalgams you see in Sky Mall: Hide your television remote in this authentic looking replica of a first edition of Great Expectations! Wrapping the cool technology in the dark wood may neither comfort nor inform. This convention is an exercise in packaging Mitt Romney in a similar way. Voters haven’t found him likable or approachable. In the latest NBC poll, when voters are asked which candidate cares about average people, Romney loses to Obama by 20 points. He’s probably not going to fix that, but Romney aides concede that their candidate has to cross a threshold in order to allow people to feel OK with handing him power. The bad economy and their unhappiness with Obama have voters ready to leave him, but they’ve got to feel a little better about Romney to make the leap. 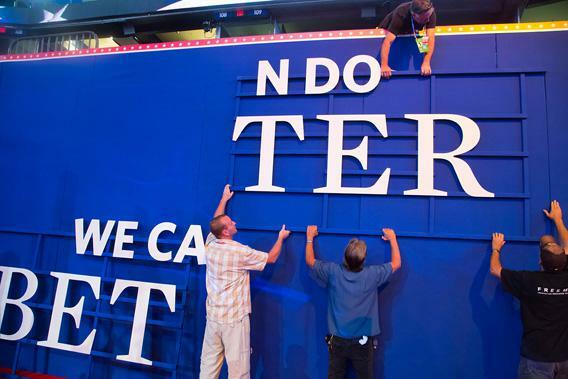 Organizers at the 2012 Republican National Convention put up a sign that will read “We can do better”. Although the Obama campaign is trying to argue that this is a Romney reinvention authored by Hollywood, we don’t know that yet. Simply trying to highlight your candidate’s best qualities is hardly an act of phony make-believe. You know who had the most successful convention reinvention? Bill Clinton. It was the Man From Hope video that helped people start to take a new look at him. The video—produced by Hollywood—simply gave people a view into Clinton’s personal history. That’s what they’re trying to do here: give the country a window into the authentic Romney. It may be one of the least phony acts of this campaign, which has been filled with claims about specificity and truth, because Mitt Romney has a lot to offer people. He has been devoted to his family and his church. He is a successful businessman who jumped in to rescue the Olympics when he was called. Pretending Paul Ryan was a bipartisan deal-maker in Congress is a fantasy. Showing that Mitt Romney is a highly competent person who has devoted a big chunk of his life to the community is a relatively easy sell. Does that make a person qualified to be president? The voters can decide that. Does it make Romney qualified? That’s up to the voters, too. I suspect they might want to know what he believes and what he’ll do in office. Making him warm through personal biography doesn’t tell us much about that.